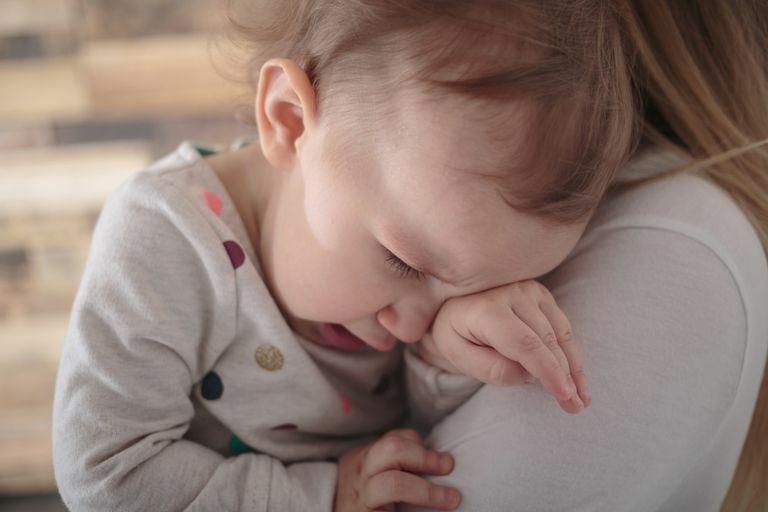 Separation anxiety is loosely defined as the fear of being away from the primary caregiver and the most common ways for children to act out their fears is through tantrums and clinging. It's a healthy and normal part of your child's development between the ages of 8 and 14 months. Separation anxiety disorder is a diagnosis for children who fall outside the boundaries of this otherwise normal developmental stage. New situations that take children out of their routine, including a new caregiver, a recent move, or a new sibling. Family difficulties, such as marital problems or financial issues, that put stress on the adults in the home have a negative effect on children. It is normal for some older children, particularly those who are shy, to go through a phase of not wanting parents to leave. However, a caregiver can typically redirect the child to engage in group activities. Children over the age of 2 who don't respond to redirection or demonstrate severe symptoms may be suffering from separation anxiety disorder. Separation anxiety disorder is a specific psychological disorder that is different from normal separation anxiety, although it can be difficult to tell the difference because symptoms can overlap. Explain what will happen in simple, direct terms to explain where you're going, who will be in charge, and when you will return. Give your son time to adjust by visiting a new school or babysitter's house together a few times. Let him get used to the new person before you leave. Remain calm and upbeat, focus on the fun that your child will have, and treat the separation as a normal occurrence. Say goodbye once no matter how much your child screams or cries, give her a big hug and kiss, say goodbye and walk out the door. Build on small successes by leaving her for only an hour or two the first day and gradually add to the length of time, always returning when you promised. Separation anxiety disorder may require professional intervention with a trained mental health professional. Gather as much information as possible before your first therapy visit, including details about your child's behavior both when you leave and while you are away. A good therapist will become part of the team that includes you, your child and the caregiver, making suggestions for all of you to follow. Over time, you may find that your child is eager to participate in each day's new activities. Kids Health: Separation Anxiety (2012). National Institutes of Health: Separation Anxiety (2011).